Pomegranate – its taste is zingy, its seeds look like rubies, and it is a powerhouse of nutrients that can do you the world of good. Pomegranate seeds have been used for centuries or their medicinal benefits and today, pomegranate is suggested to help fight against high blood pressure and cholesterol, and inflammation. Pomegranate oil is also now a very popular ingredient in makeup products and is thought to be an anti-ageing ingredient that also helps to protect the skin from the sun and harsh weather. But what is the evidence behind all these claims of the powers of pomegranate for health? Pomegranates are red skinned fruits with lots and lots of tiny seeds all covered with a layer of soft fruity flesh. Pomegranate grows on trees that look similar to bushes and it is thought that it is native to Iran. In the modern world, the fruit is common throughout the Med, South Europe, the Middle East, Africa, Southeast Asia, Arizona and California. The name pomegranate means ‘fruit of paradise’ in Hebrew and Arabic and it has been associated with health, fertility, longevity, prosperity and marriage for thousands of years. It is thought that it may be linked to fertility due to its masses of seeds. The seeds of pomegranate are a great source of fibre, and a 100g serving gives you around 10-12% of your recommended daily amount of vitamin C and 16% of your vitamin K.
Also, they contain anthocyanins, punicalagins and ellagic acid all of which are powerful antioxidants. Most of the antioxidants are found in the skin and the pith or white membrane under the skin. Almost all parts of the pomegranate plant, including fruits and flowers, roots and bark and even squeezed juice have been and still are used for medicinal purposes throughout various cultures. Even in the oldest ever medical document preserved from Egypt circa 1500 BCE, there is a reference to the medicinal use of pomegranate for roundworm. The Hippocrates are also recorded to have used the extract from the pomegranate seeds to treat various illnesses such as inflammation in the eyes and of the skin, and to treat digestive problems. Other cultures have used pomegranate for stomach relief, oral and genital sores, problems with gums and teeth and parasite treatment as well as snakebites, diabetes, diarrhoea, bronchitis and leprosy. Many cultures make tea and tinctures from the dried rind and pulp for the treatment of digestive problems, diarrhoea and stomach pain. Pomegranate’s effect on the heart has also been studied. One particular study on subjects with thinned arteries showed that by drinking one 50ml glass of pomegranate juice for 3 years reduced bad cholesterol and reduced oxidation damage from cholesterol in the arteries resulting in better blood flow. Another trial providing subjects with the same amount of juice daily displayed a reduction in blood pressure on average of around 5%. It is shown to reduce the risk of heart attack, increase blood flow and reduce hypertension and high cholesterol. 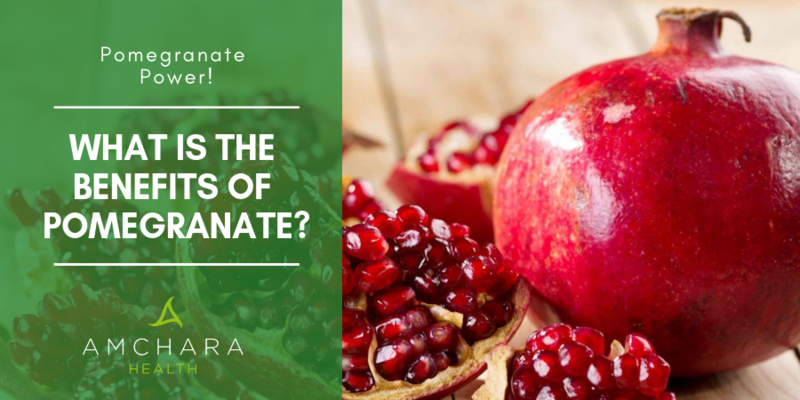 Although you can get some of the benefits of pomegranate through supplements, it is always recommended that you get the benefits by eating raw pomegranate seeds or flesh, or by making tea from dried pomegranate. One great way to enjoy pomegranate is by sprinkling the seeds and surrounding flesh on salads. Pomegranate oil is fantastic for the skin which is why it has become popular in cosmetics. It is rich and moisturises the skin beautifully. Studies have shown the oil to stimulate the cells in the outer layer of skin. Pomegranate oil also fights free radicals thanks to its antioxidant content and this helps to fight premature ageing of the skin and could help to protect against skin cancer. Drinking the juice and oil also helps to protect the skin against damage from the sun, helping to keep you younger looking into your old age.